First up, Rev. Keith Anderson! Keith will be on the panel with UUA pastor Rev. Dr. Victoria Weinstein (aka PeaceBang) and Archdiocese of Boston Social Media director Domenico Bettinelli discussing what the Church looks like online. Keith will also be leading a workshop on “The Art of Digital Ministry,” which I think will be perfect for those concerned that social media may detach us from meaningful, interpersonal pastoral care and ministry. Now, I met Keith for the first time when I crashed a Lutheran workshop on social media. I was so impressed at how Keith was thinking theologically about why the Church should use social media. Moreover, he was thinking as a Lutheran! I’ve been consistently impressed how Keith and Lutheran Church of the Redeemer are using social media as a congregation, especially their “Two Minute Bible Study.” There’s a lot most churches can learn from Pr. Keith and Redeemer, and yet, I’ve found Keith’s teaching accessible, non-judgmental and theologically solid. When I first crashed that workshop, I had never tweeted, hadn’t dreamed of using a blog for ministry, and we were just beginning to build Massachusetts Council of Churches social media ministry. Keith’s wise counsel and support helped faithfully prod us to try using these new tools. I am thrilled that Keith has agreed to help lead us on Saturday April 28 and hope you come to see him IRL ( IRL=In Real Life in Twitterspeak) too! Register for Christian Unity in the Digital Age here. Keith Anderson is pastor of the Lutheran Church of the Redeemer in Woburn and co-author with Elizabeth Drescher of the forthcoming book Click2Save: The Digital Ministry Bible. 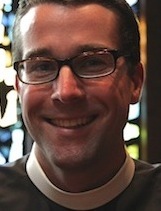 A popular blogger on religion, new media, and popular culture at pastorkeithanderson.net, he employs a wide range of social media to minister on and offline. Pastor Anderson speaks regularly with local and national church groups, synods, and other organizations on the practice of digital ministry and the impact of digital culture on face-to-face ministry. He has taught at Andover-Newton Theological School and The Lutheran Theological Seminary at Philadelphia. He received pastoral training at Harvard University Divinity School and The Lutheran Theological Seminary at Philadelphia. Ministry in digital social media is not an entirely new kind of ministry. Rather, it is an extension of traditional face-to-face ministries like offering hospitality, caring of others, forming disciples, building community, and advocating for justice into digital spaces, reaching people within and well beyond our local communities. Using practical examples of digital ministry practitioners drawn from his forthcoming book with Elizabeth Drescher, Click2Save: The Digital Ministry Bible (Morehouse, May 2012), Pastor Keith Anderson will present a model for digital (and face-to-face) ministry that is characterized by listening, attending, connecting, and engaging. Recommended Reading: Tweet if You Heart Jesus: Practicing Church in the Digital Reformation, Elizabeth Drescher, Morehouse 2011. Click2Save: The Digital Ministry Bible, Elizabeth Drescher and Keith Anderson, Morehouse 2012.